Napoleon once said that if the whole world was a country, Istanbul would be the capital. And though I can not know what Napoleon saw in this city hundreds of years ago, and what exactly he had in mind, I would somehow agree with him. 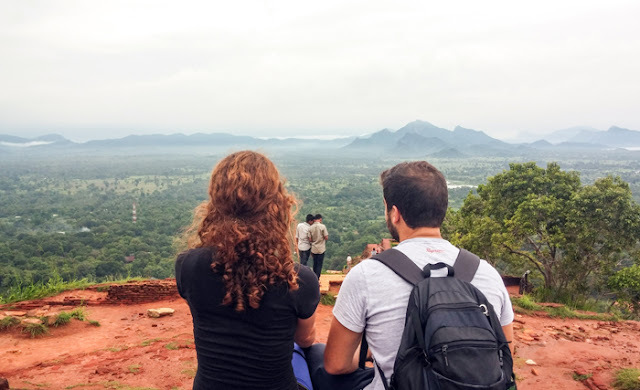 It's not just its geographic location and the fact that all you have to do is cross a bridge to get to know two different continents, two different worlds. They are all these different empires, the nations, the invaders and the religions that have passed from this city and left their mark, which makes this city so different and so rich. Hagia Sophia: Apart from a very impressive temple, Hagia Sophia is at the same time a great part of the city's history. A perfect example of the ongoing struggle between the Christian and Islamic world. It was built by Justinian between 532 and 537 and was the largest cathedral in the world for 1,000 years until the construction of the Seville Cathedral in 1520. 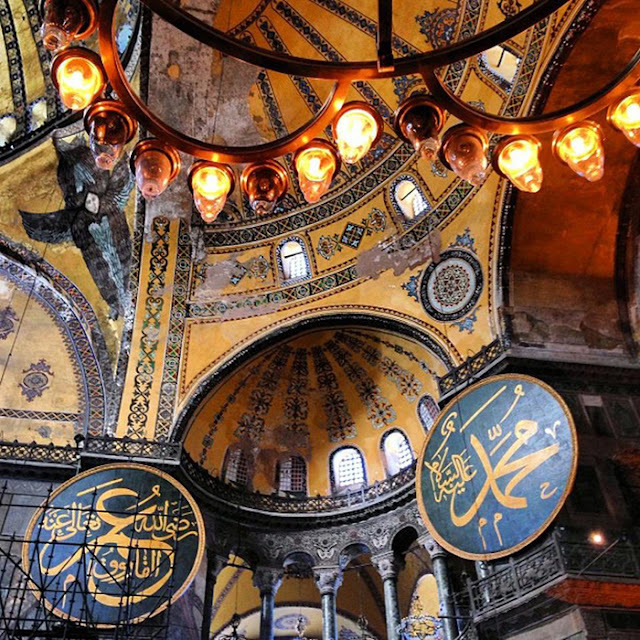 After the conquest of Istanbul in 1453, Hagia Sophia became a mosque, and since 1935 operates as a museum. Blue Mosque: The Sultan Ahmet Mosque or Blue Mosque, as it is best known, is one of the most stunning things to see in Istanbul. It is a very large mosque consisting of five main domes and six minarets. Its interior is decorated with beautiful carpets covering the whole floor and with over 20,000 handmade blue tiles. Royal Kinsterna:This underground tank was built in 532 to bring drinking water to Istanbul. For its construction, 336 columns were used, which had come from old temples. Royal Kinsterna was later closed, and was discovered again by accident by local residents in 1545. Galata Bridge and Tower: The Galata Bridge is 490 meters long and connects the Sultanahmet area with Beyoğlu. This bridge, built in 1994, is the fifth bridge built at the same site. From the top of the bridge pass vehicles and pedestrians, while it is usually full of fishermen. At the bottom there are several restaurants where you will find mostly seafood. On the north side of the bridge you can see the Galata Tower, which is 67 meters high and offers panoramic views of the Bosphorus and the Golden Horn. Dolma Bahce: One of the brightest palaces in the world, Dolmabahce Palace, with its 250 rooms and beautiful gardens, is one of the most spectacular sights in Istanbul. The moss-like wooden flooring and the huge crystal chandelier weighing 3.5 tons in the throne room are particularly impressive. Taksim Square & Istiklal street: Apart from the point where all the demonstrations in Istanbul start, Taksim Square, the central square of the city is the heart of modern Istanbul. Around the square there are many shops, restaurants and hotels.A large pedestrian street, Istiklal also starts from here. Grand Bazaar: Grand Bazaar (Kapali carsi), built in 1461, is one of the oldest and largest covered markets in the world. It consists of more than 4000 stores, which occupy 61 roads. Although quite impressive, it is very touristy and overwhelmed by people, so it is best to visit it early in the morning. Spice Bazaar: The Mizir carsisi or Egyptian market, as it is also known, is just a short distance from the Grand Bazaar, and although it is smaller, it is also a less tourist experience that makes your walk here more enjoyable. It is a great market where you will find mainly spices, tea and dried fruits. Turkish bath: A day in Istanbul is always full and can be quite tiring. Let yourself relax at the end of the day, enjoying a massage and a hot steam bath in one of the historic Turkish hammams. Bosporus Cruise: If you are tired of walking around the city, it is a nice idea to take a break by catching a boat to take a small cruise (about 2 hours) to the Bosporus. It is also a unique experience to see Europe on the one hand and Asia on the other. Sunset: The sunsets in Istanbul are always very impressive. The orange color of the sky, and the sun losing behind the mosques of Hagia Sophia and the Blue Mosque combined with hundreds of seagulls flying in the sky makes the spectacle gorgeous. You can see the sunset from one of the rooftop bars or from Galatas Bridge, but for me the ideal spot is Uskudar. Take the fer ryfrom Eminonu to Uskudar station and walk alongside the Bosporus until you find dozens of Turks and tourists enjoying their tea waiting for the sunset. Turkish breakfast: Turkish habits at breakfast are slightly different from European. Here, tea replaces coffee. Also their breakfast consists of many different dishes including tomatoes, cucumber, bread, cheese, yoghurt, olives, butter, honey, jam, eggs, sausage and various kinds of pies. Kofte: Meatballs in Istanbul are scrumptious. They are made from lamb or veal meat and contain enough spices and herbs. They are usually served with rice, green peppers or a red spicy sauce. Kebab: Kebab is made of lamb meat which is kneaded with dried red and green hot pepper and baked on the grill. They are usually served with bread, roasted onion and green peppers. Fish sandwich (Balik ekmek): One of the most popular street foods in Istanbul is fish sandwich. These are mackerel fillets, grilled, salted and sprinkled with red pepper, placed on a bread roll with onion, lettuce and lemon juice. You will find them on the floating fishing boatsnext to Galata Bridge. Stuffed potato (kumpir): Kumpir, is also a very widespread street food in Istanbul. This is a cooked potato which is cut in the middle and salted butter and cheese are added. Then everyone adds the filling they like: mayonnaise, pickles, corn, sausage, mushrooms, etc. The best area to taste the kumpir is Ortaköy. Baklava: The most popular dessert in Istanbul is baklava. Baklava is baked and made with dozens of layers of paper-thin filo pastry, syrup and rather hazelnuts, walnuts or pistachio. If you want to taste some of the most delicious meatballs in Istanbul you have to go in Tarihi Sultanahmet Köftecisi near Hagia Sophia. For kebab, I have to suggest Zübeyir Ocakbaşı, near Taksim Square and Yirmibir Kebap. If you go to Ortaköy, just take a stroll from Borny's Kumpir to try stuffed potatoes. May Istanbul be famous for baklava, but the Turks also make a great profiterole. Visit İnci Pastanesi where you will eat the best profiterole of the city. Finally, if you want to have your drink overlooking the city, my favorite spot is Leb-i Derya. Istanbul is a big city with many uphill and downhill, which means you can not explore it only on foot. It has, however, a fairly good transport network, but because it is a fairly large city with many different transport options (underground,trams, buses and ferries) this may sometimes seem a little complicated. Istanbulkart is the best way to pay for your transportation as it is a reusable card covering all public transport. Istanbul is a quite cheap destination in terms of accommodation. What you have to think about before you end up in your hotel is where you want to stay. If you are more interested in exploring the Old City and its Roman heritage, Sultanahmet is the ideal place. If you want to be closer to the modern side of the city and you are interested in shops and entertainment, Galata area is the ideal. If you are a hostel type, the Stay Inn Taksim Hostel is a great choice. The easiest way to get to Istanbul is by plane. Turkish Airlines and many other world airlines have regular daily flights to Istanbul. The city has two international airports; one on the Asian side (Ataturk Airport) and the other one on the European side (Sabiha Gokcen Airport). 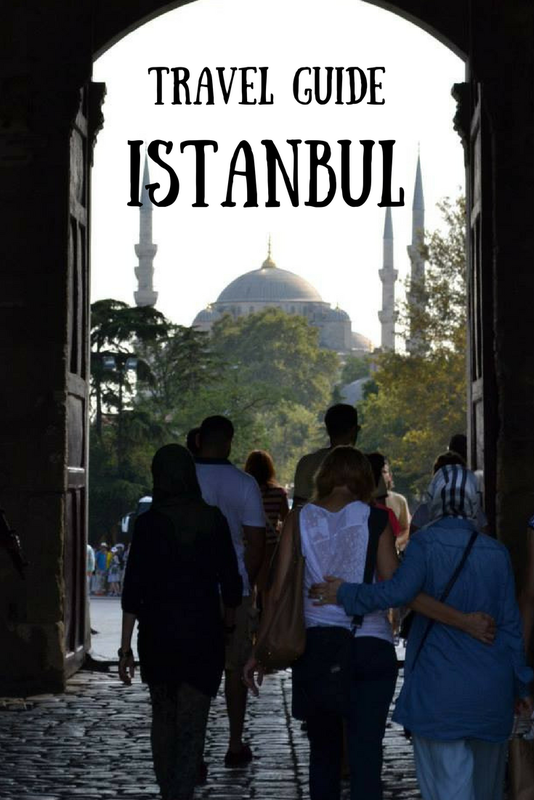 You can also go by bus.Istanbul is well connected to many European cities by private bus companies run scheduled buses to Istanbul from Germany, Austria, Switzerland, France, Greece, Bulgaria, Russia etc. Spring and Autumn are the best times to visit the city. The weather is good, the days are long, crowds at the city's attractions are manageable, and room rates are average. The winters are fairly cold and rainy, while in the summer the heat is very intense.